Diphenhydramine is an antihistamine, also known as the generic form of Benedryl. It is used to treat allergies, insect stings/bites, motion sickness and travel anxiety. The medication is safe for all ages and weights of dogs or cats. It should not be used by dogs or cats that are pregnant or nursing. Dosage is .5-2mg per pound of your pet; be sure to administer the proper dosage. See directions below and your package instructions for details. Always follow your veterinarian's prescribed dosage if it differs from the standard dosage recommendations. 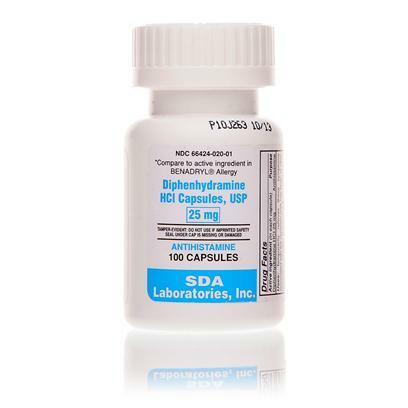 Diphenhydramine is the Generic Alternative to Benadryl and/or Apoquel. Common side effects are drowsiness and dry mouth. Your pet may also develop urinary retention. Other side effects that are less common include diarrhea, vomiting and lack of appetite. If any symptoms appear to distress your animal, contact your veterinarian. Always tell your veterinarian all the medicines your pet is on before adding new medications. Do not use if cat or dog is pregnant or nursing. Do not administer to pets suffering from glaucoma, high blood pressure, urinary obstruction, and prostate disease. Use with caution when given with other CNS (central nervous system)-depressant drugs such as tranquilizers or barbiturates. Use caution when used in conjunction with CNS depressants, heparin, warfarin, and epinephrine. Use as directed by your veterinarian. The typical dosage is .5-2mg per pound. Administer pill orally. Do not mix in with food.